My favorite aspect of DIY is finding new, low-cost methods to make home décor items that would normally cost so much more to buy. I’m a huge proponent of making your own home décor items to save money and also give your home a personal touch that can only come from you! However, every once in a while you come across a project that will cost you far more to make than to just buy. I came to realize that when I was elbow deep in green paint as I tried to make a boxwood wreath. 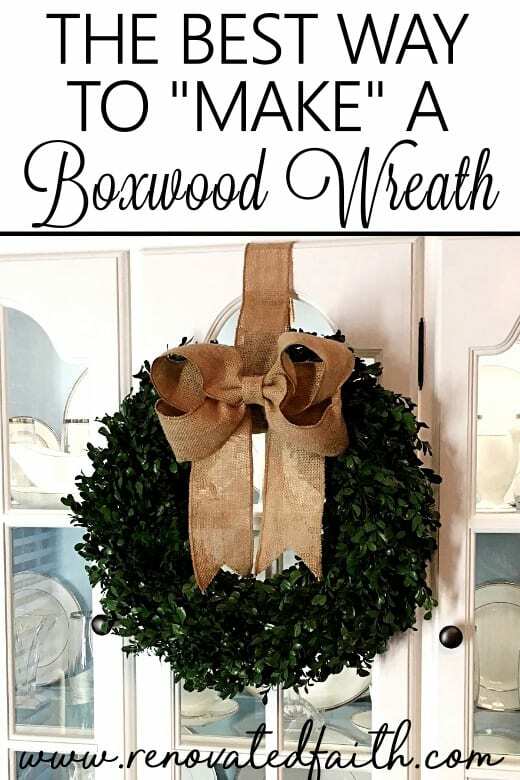 Here are some tips on how to not only the best way to make a boxwood wreath but how to determine whether to DIY or buy your next home decor item. Should I Make a Preserved Boxwood Wreath? My goal was to make a boxwood wreath that looked life-like but that would not require maintenance of any kind. Often times the preserved boxwood leaves you find online have to be sprayed with water every so often so they don’t turn brown. When I thought about going this route, all I could visualize was having to spray a wreath all the time and then also having to clean whatever mirror or glass door was right behind it when it got wet. Nope! Should I Make a Wreath with Faux Boxwood Sprigs? I knew I could buy the faux boxwood sprigs in a craft store but so often they don’t look like real boxwood branches – not even close. I even considered buying preserved boxwood sprigs online, but surprisingly they are were very expensive. How To Make An Artificial Boxwood Wreath – My First Attempt but Not Last! So I devised my plan. I decided to make a boxwood wreath from the boxwood bushes in our front yard. You can’t get much more “free” than that, right!?! The plan was to preserve the branches and then spray paint them once they dried so they would never turn brown. Then, once I spray painted them, I would make a large wreath or two that literally only cost me the price of a can of spray paint! I read a few posts online on how to dry boxwood and laid all the boxwood sprigs out in our guest closet that had shelves and also a couple storage racks in our guest room. Needless to say we didn’t have any overnight visitors during those few months. By that time, our guest bedroom was covered in brown boxwood sprigs and the smell was horrendous. It turns out boxwood has an odd scent and in high concentrations it can be pretty pungent. It was a strong reminder that this little DIY project of mine might not go as planned! Three long months passed. The time had finally arrived to spray paint my boxwood sprigs, so I headed off to Hobby Lobby for one can of craft-grade spray paint in boxwood green. I laid out all the boxwood sprigs on two sheets in my garage. I failed to grasp the amount of spray paint it took to fully cover boxwood leaves. I used up one $7 can of spray paint and it only covered 10 springs… Only a couple hundred more to go. Most intelligent people would have given up at that point, but not me. But I had already bought a can of spray paint after all! At this rate, I thought the spray paint wasn’t going to work. So, I went to Home Depot and got a gallon of green paint so I could use my paint sprayer. I even took a sprig of fresh boxwood with me to color match it EXACTLY. I thought I was just so clever at the time. Before I knew it, every single branch was sailing out of the garage, some leaving a trail of green paint on the garage floor and driveway as they flew by. I had totally underestimated the air power of my paint sprayer. I wish I had a video but judging by the look on my new neighbor’s face, it was pretty funny. After a second gallon of paint, I finished the project by spraying each branch ONE AT A TIME with my paint sprayer as I held each in my hand. Yes, my hands were green and so was most of the garage. After the paint on the boxwood sprigs dried, I used a wire wreath form and wired them to it one at a time. All those sprigs yielded just one large wreath and a small one. Yes, the wreaths turned out pretty in the end but was it worth the cost, frustration and time? Absolutely not. Even after all the mishaps, I absolutely love my two wreaths and will keep them always. If I had to make a boxwood wreath all over again, I would have bought a preserved boxwood wreath online like one of the wreaths below. I’d then add a burlap bow as an extra accent (See my Burlap Bow Tutorial here.) Then, if the boxwood leaves turned brown over time, I’d just spray them outside with a heavy-duty spray paint in green like this one. 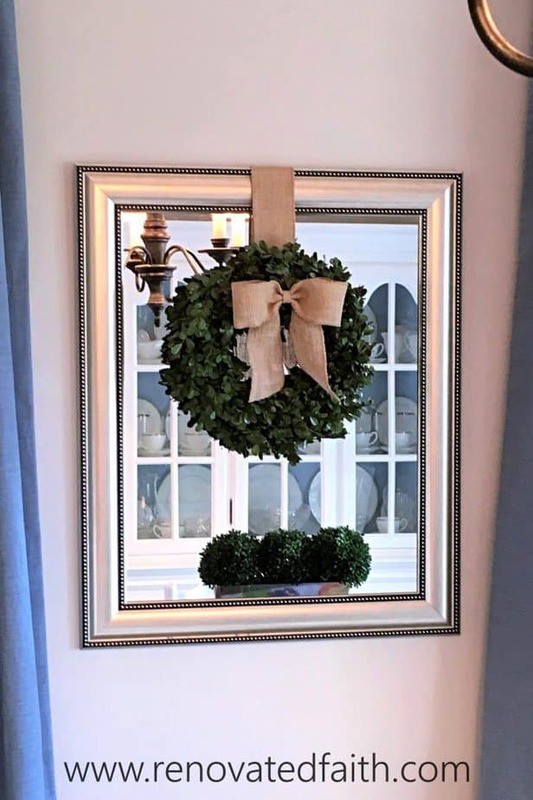 This would work better than spray painting the sprigs individually like I did because you are only really having to coat the side of the leaves facing out that are already on the wreath. All in all, I spent $130 on wreath supplies and cleaners for the garage floor but that doesn’t include the time and hassle. 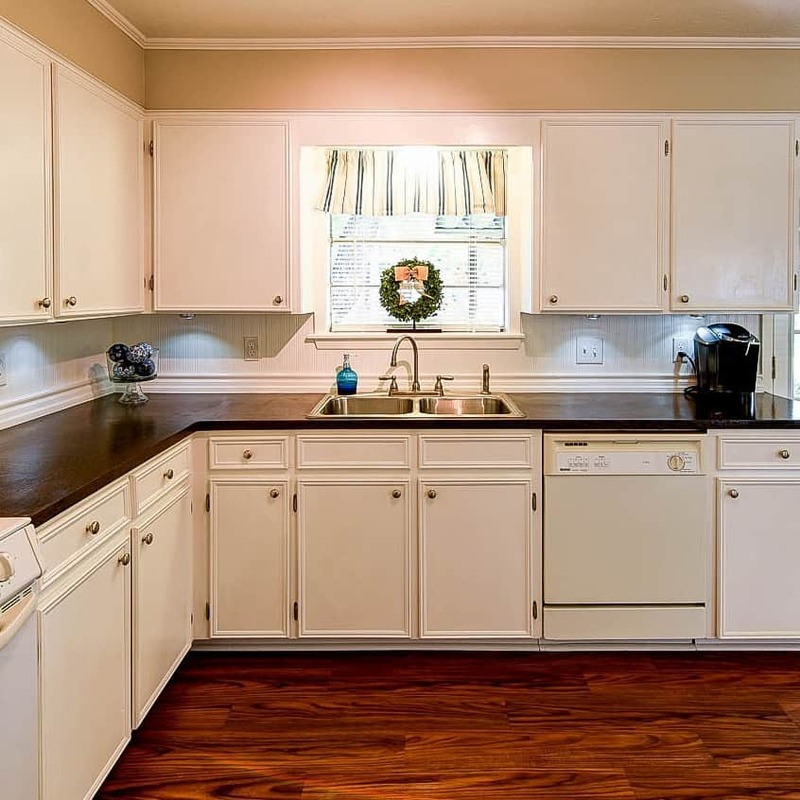 It also doesn’t include the cost of repainting our garage before we moved (I give tips for painting the garage here) and the cost to replace the poor boxwood bush that died. 1. Start Small – If you are trying out a DIY idea or paint technique you are unsure of, do a small-scale version first. For example, whenever I have the idea for a furniture painting technique, I try it out on a small piece of wood instead of a whole piece of furniture. It takes a little extra time but I’d rather have the opportunity to refine my process and determine if it is worthwhile before trying to experiment on an entire dresser. For the boxwood wreath, I should have tried to preserve just a couple boxwood sprigs first before going crazy with two whole garbage bags full. 2. Price out items online – Get an idea of how much your project would cost if you were to just buy it and also make a detailed list of all the DIY supplies and their total cost. 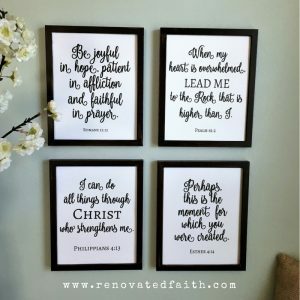 You might be surprised with what you find online at hobbylobby.com, target.com or consumercrafts.com. They might just surprise you! If you don’t decide to buy online, then you have even more ideas for exactly what you do want to DIY! 3. Don’t be afraid to go semi-homemade. 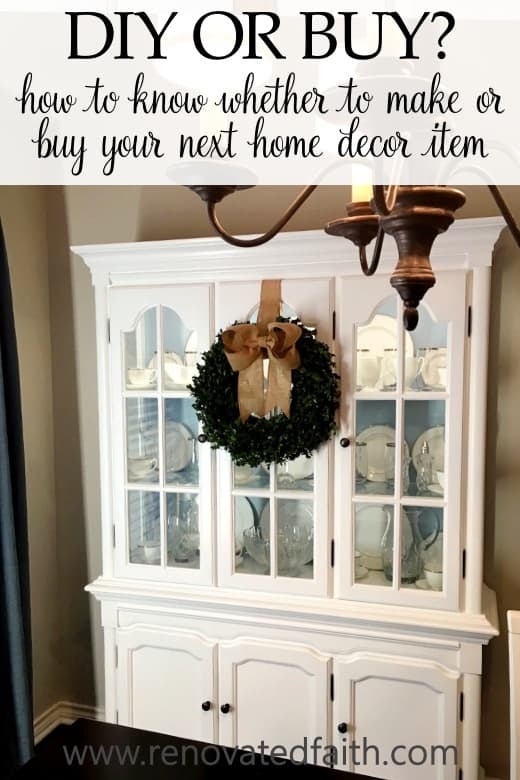 Doing a DIY project doesn’t mean that you can’t buy an already made home décor item and then improve upon it to make it your own. That’s what I should have done with the boxwood wreath. It would have been much better to buy an already made wreath and add a burlap bow. 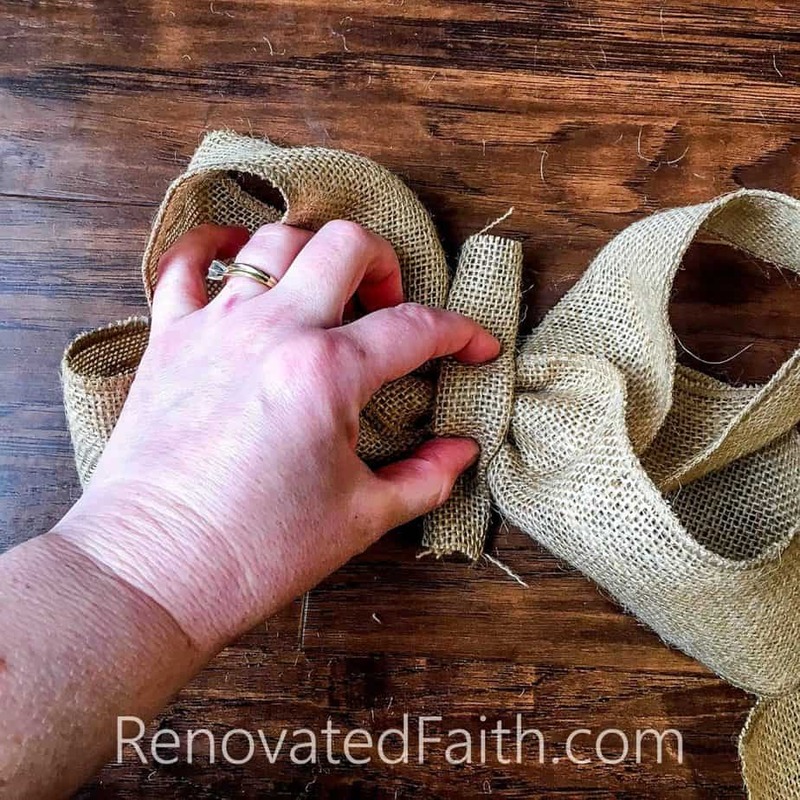 CLICK HERE for my Burlap Bow Tutorial. 4. Consider your time and effort in the equation. Time is money so even if a project costs you very little, is it really worth it if it takes you several days and you get no enjoyment out of it? 5. Would you enjoy making it? 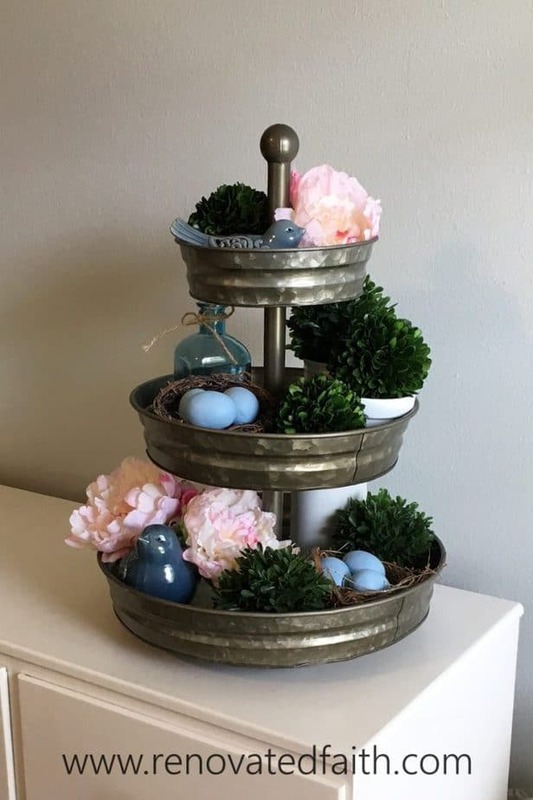 I love making my own home décor items because it allows me to take something someone else has made and do my own spin on it to match my personality and décor style. Not to mention, working with my hands is so relaxing to me. If you would enjoy the experience of making your own version and also personalizing it to your tastes, by all means, do it yourself! 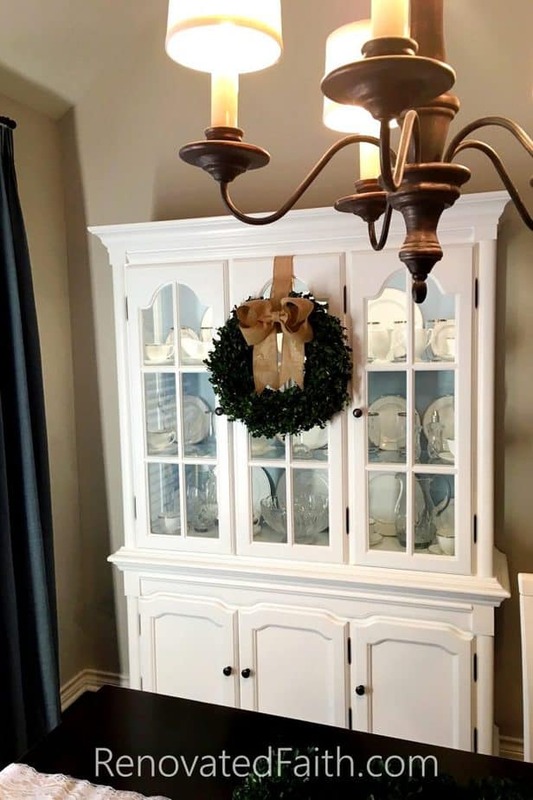 Hopefully, I’ve given you some things to consider not only in how to make a boxwood wreath or whether to buy or diy your next home decor project. Most of the time, I like to DIY but there are definitely those projects that aren’t worth the cost and effort if the online version is already not very expensive. 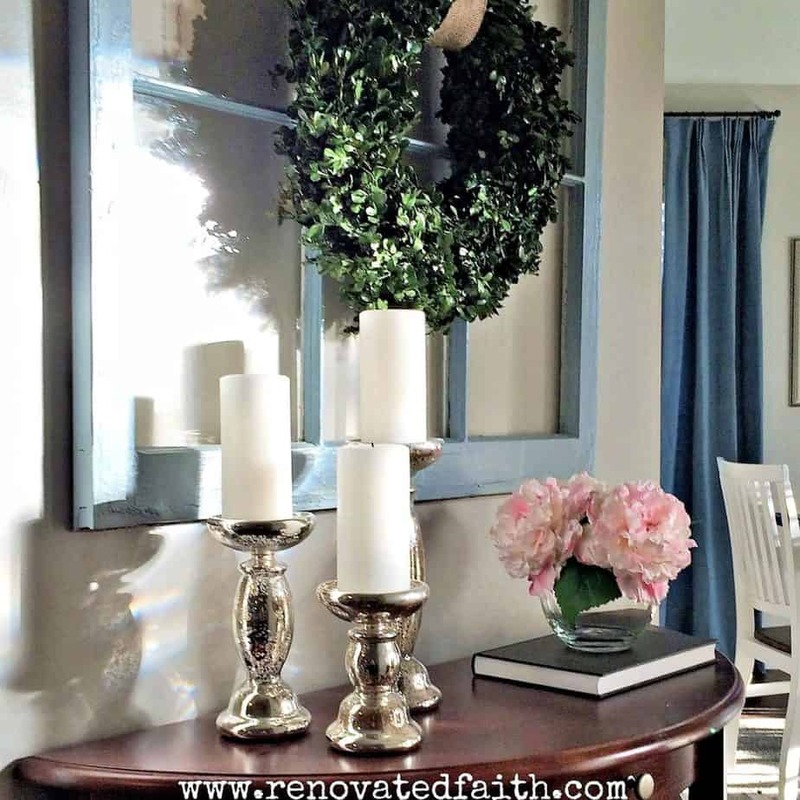 Did you like this post on how to make a real boxwood wreath? Be sure to share it with others. Have a wonderful week! this is an excellent reminder!! Most of the time I DIY to get a custom piece at a much more affordable price. However, I’ve been able to find wreaths and seasonal things at places like Kirkland Home that are much more cost effective. Love your blog!